Don Mueang Airport has two terminals. Terminal 1 is for International flights and Terminal 2 for domestic flights. Terminal 2 has recently been refurbished and is shiny and modern. 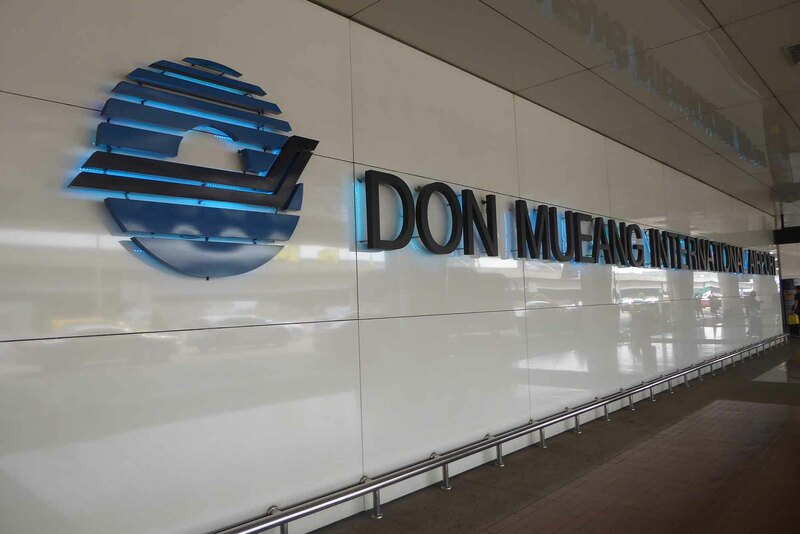 Don Muang Airport is Bangkok’s 2nd airport and is a hub for domestic flights in Thailand. There are also International departures to regional destinations. and domestic services of low-cost airlines. Air Asia, Nok Air, and Thai Lion Air all arrive and leave exclusively from here. 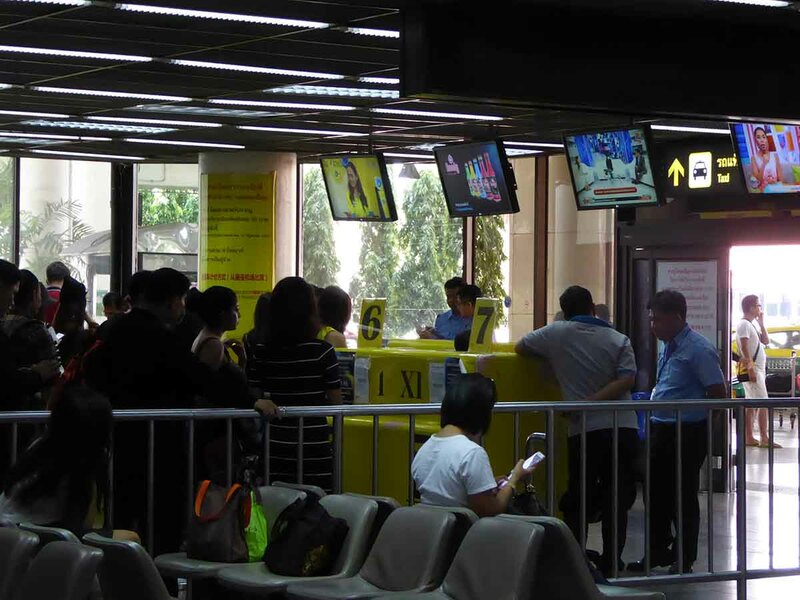 There are Bangkok Airport information counters in both terminals in the arrivals hall. 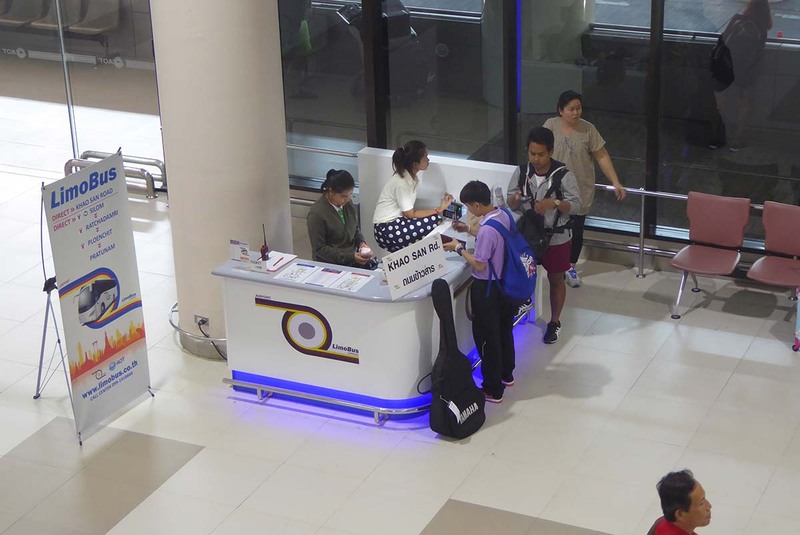 There is a left luggage office on the 2nd floor of Terminal 1 charging 150 baht per piece per day or 75 baht if less than 24 hours and an AIRPORTELs left luggage office on the ground floor of Terminal 2 charging 69 baht per day. If you need medical help there is a medical center on the 1st floor of Terminal 1. 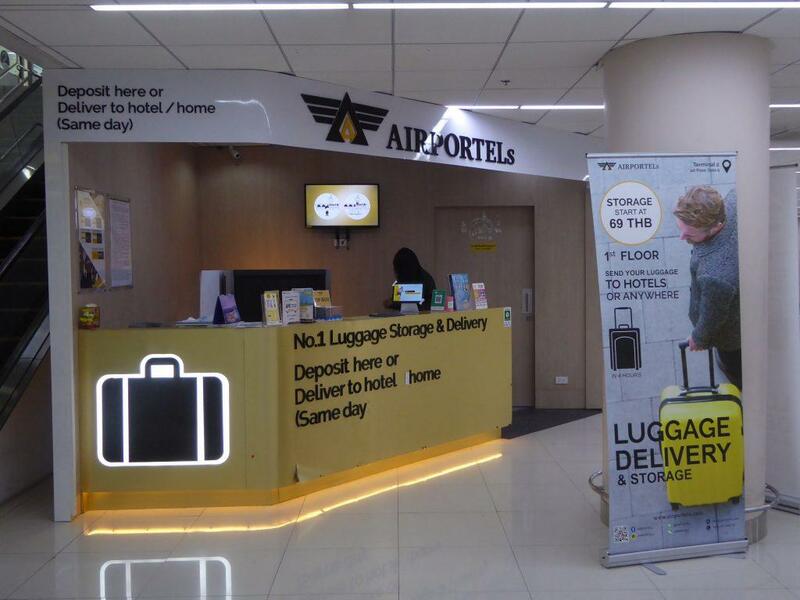 A post office is on the 3rd floor of Terminal 1 near the Air Asia check-in desks. 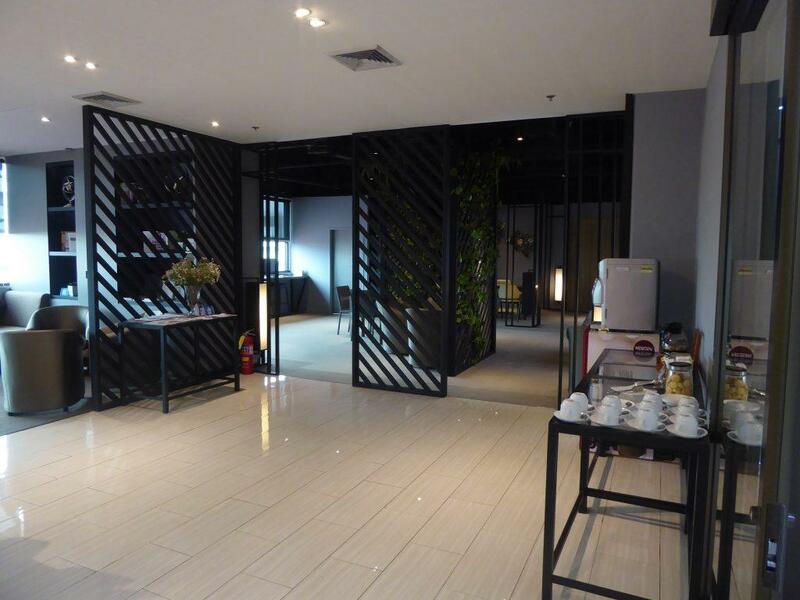 Free WiFi is available within the passenger terminals and there is a co-working space featuring a lounge, buffet, cafe and fast internet on the 4th floor of Terminal 2 open from 06.00-22.00. The cost is 350 baht for 2 hours (not including food). There is a good choice of shops, cafe, and restaurants such as Starbucks, Burger King, Subway and McDonald’s. There are more restaurants on floor 4. 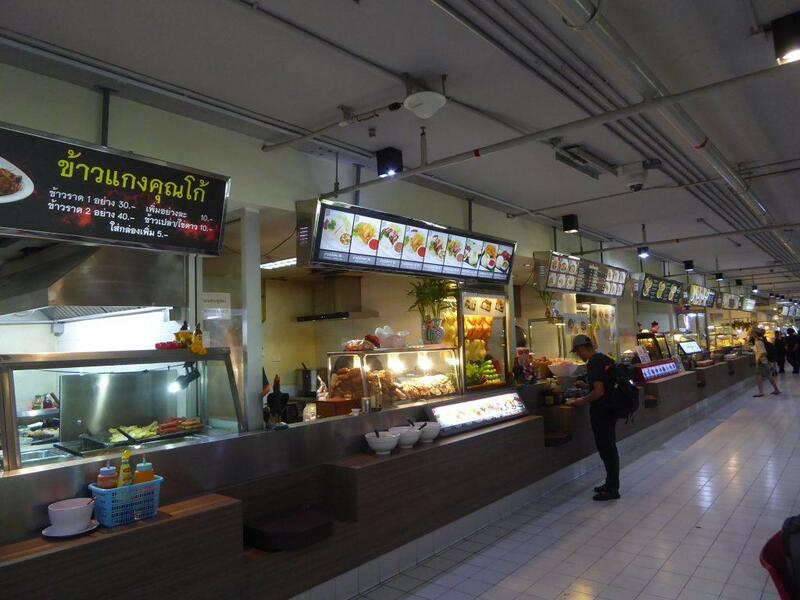 The Don Mueang Airport Food Court is called Magic Garden. There are two branches, a 24-hour international food court on the 2nd floor of Terminal 2. 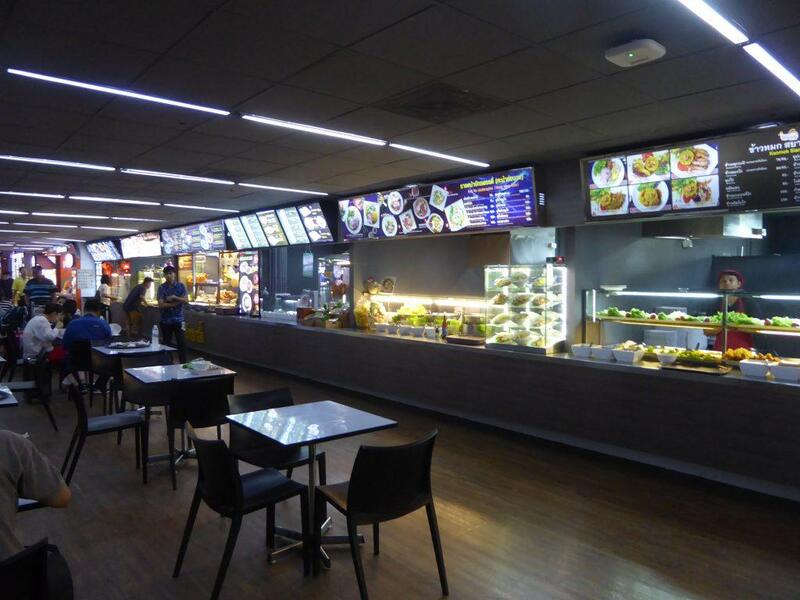 It has a cheap Thai street food style section as well as more expensive fast food brands. The other Don Mueang Airport food court is called Magic Garden 1. It’s in Terminal 2 on level 3 just inside the car park building past the 7-11 though it is only open from 06.00-22.00. Meals cost 50-80 baht and coffee is 30 baht. It’s the cheapest place to eat at the airport. There is also a 24 hour 7-11 just before the food court. The Amari Airport Hotel is opposite the airport and connected to Terminal 1 by a walkway from level 2. The hotel has day rooms, Swimming pool, Fitness center and a Henry J Beans restaurant. 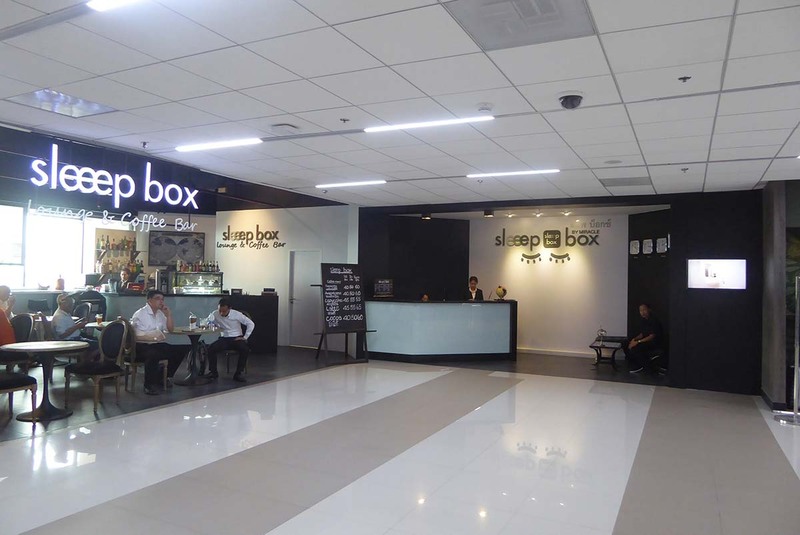 The newly opened Sleep Box is on the 4th floor of Terminal 2 and offers 15 square meter rooms which include air-conditioning, a bathroom, TV, and WiFi. Room rates are 1800 baht a day or 1000 baht for 3 hours and 200 baht for each extra hour and there is a 24-hour cafe. You will also receive a 200-baht food voucher. There are other hotels & hostels near to the airport. 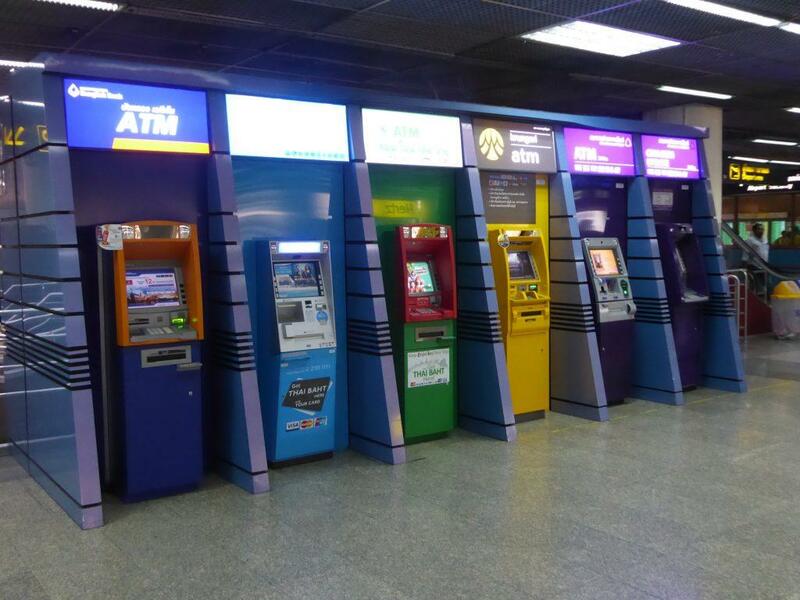 There are several Thai banks with exchange booths in both terminals. Rates are slightly lower than what you will get outside the airport but are better than those offered by the major banks at Suvarnabhumi. There is no Super Rich exchange at Don Mueang. There are branches of Krung Thai, Bangkok and Kasikorn banks just outside the ground floor arrivals in Terminal 1 where you will get a slightly better rate than the exchange booths inside. Turn right when exiting arrivals. If you are bringing a large amount of cash with you consider getting a Miracle Thailand E-Money Card at Krung Thai during normal banking hours (08.30-16.30). You will find ATM machines throughout the airport terminals once you have exited immigration and customs. You can buy an International tourist sim card after you exit immigration and customs. There are three local service providers. DTAC, True Move, and AIS. 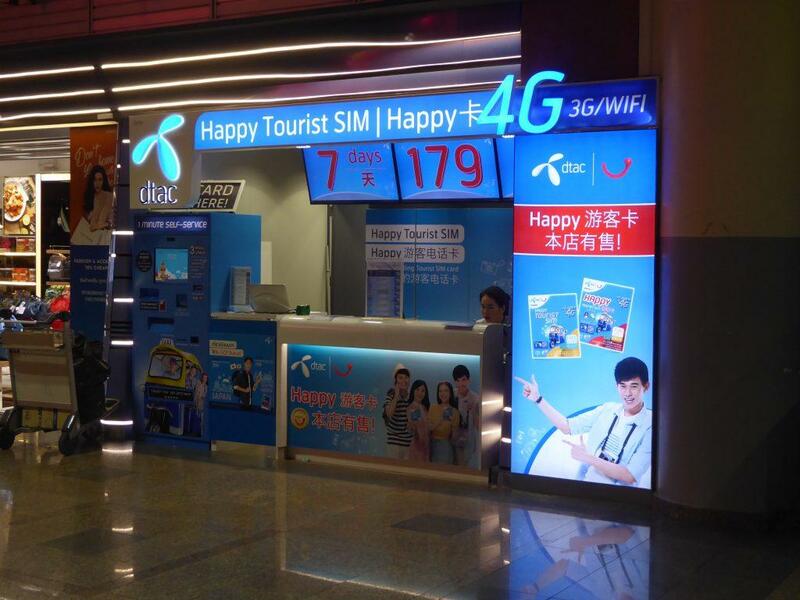 AIS and DTAC have counters on the ground floor of Terminal 2 in the passageway connecting Terminals 1 and 2 and on the ground floor of Terminal 1 along with True Move. Taxis depart from gate 8 in Terminal 1 and from the parking building on the ground floor of Terminal 2. The Airport has a queue management system. You will need to take a Queue card from the machine and go to the booth when your queue card number appears on the overhead screen. You will then be directed to your taxi. The taxis have meters and the fare depends on the distance traveled. There is a 50-baht surcharge added to the fare and the passenger must pay any tollway fees. Service is 24 hours. Make sure the taxi driver turns the meter on and keep your receipt from the taxi stand if you need to complain later. How much is a taxi to central Bangkok? Most taxi drivers are honest but some are not. The rough cost of a taxi from Don Mueang to central Bangkok is 250 – 350 baht including surcharge and tollway fee. Only use the official taxi rank and ignore offers from unofficial touts in the terminal who will try to overcharge you. 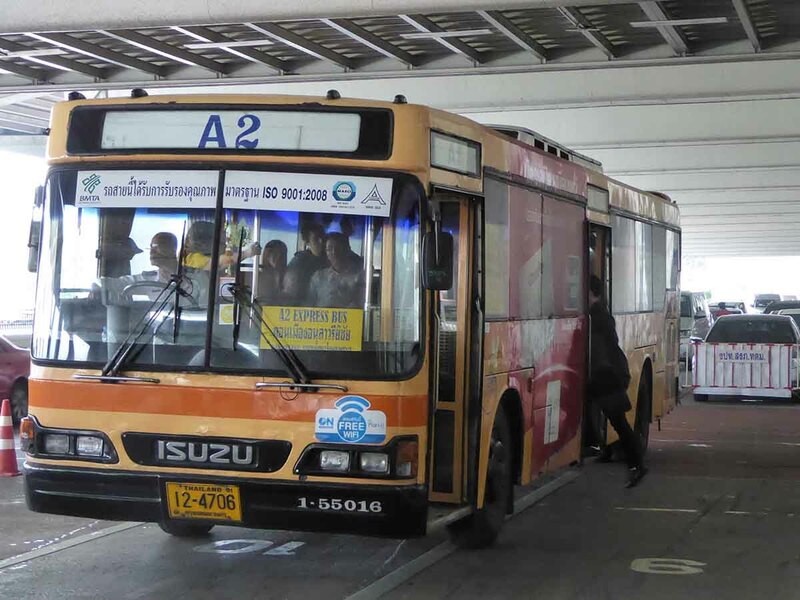 The Don Mueang Airport Bus has 4 routes. Don Mueang to Morchit BTS station (A1), Don Mueang to Victory Monument (A2), Don Mueang to Lumphini Park (A3), and Don Mueang to Khao San Road (A4). Travel is direct via the tollway and is quick. The fare is 30 baht on the A1, A2 and 50 baht on the A3 and A4. Departures are from gate 6 at Terminal 1 and from gate 12 at Terminal 2. Don Mueang Airport Buses leave every 30 minutes. Bus A1 07.30 – 24.00, Bus A2 08.00 – 22.00. 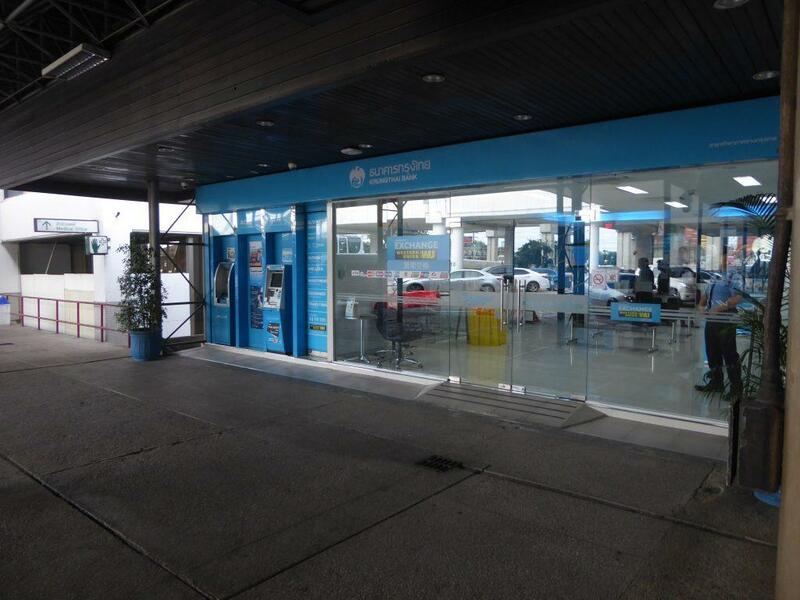 Bus A3, A4 07.00-23.00. Buy your ticket on the bus. 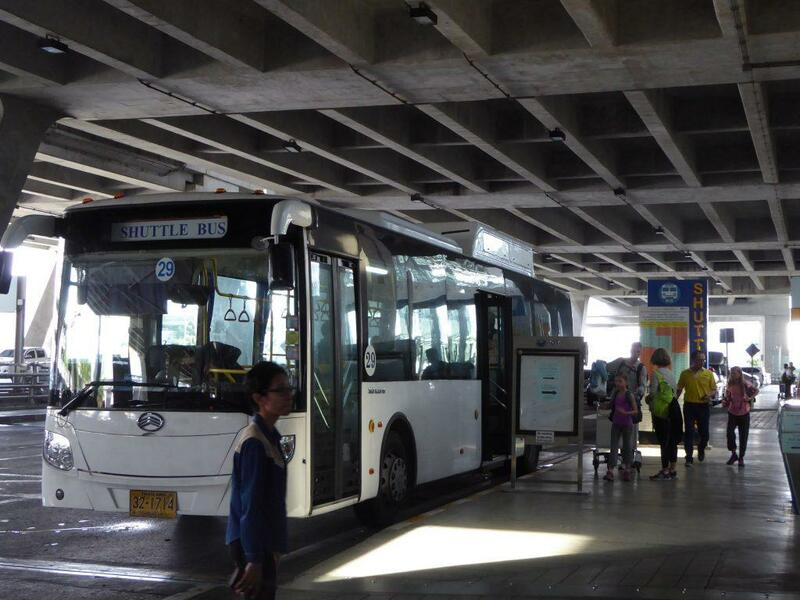 A1 Don Mueang – Expressway – Mochit (BTS) – Morchit 2 (Bus Station). A2 Don Mueang – Expressway – Mochit (BTS) – Saphan Kwai – Ari – Sanam Pao – Victory Monument. A3 Don Mueang – Expressway – Din Daeng – Pratunam – Ratchaprasong – Ratchdamri – Lumphini Park. A4 Don Mueang – Expressway – Chinatown – Lan Luang – Phan Fa – Democracy Monument – Wat Bowonniwet – Khao San Road – Sanam Luang. The Limobus has 2 routes. Don Mueang to Khaosan Road & Don Mueang to Lumpini Park. The buses travel via the expressway. The fare is 150 baht. Buses leave every 30 minutes from 09.30 until 00.40. The bus departs from between gates 6 and 8 on the ground floor of Terminal 1 and from gate 14 of Terminal 2. Ticket booths at the gates. Free WiFi on the bus. Book tickets to Khao San Road. Bus 29 to Victory Monument & Hualamphong. 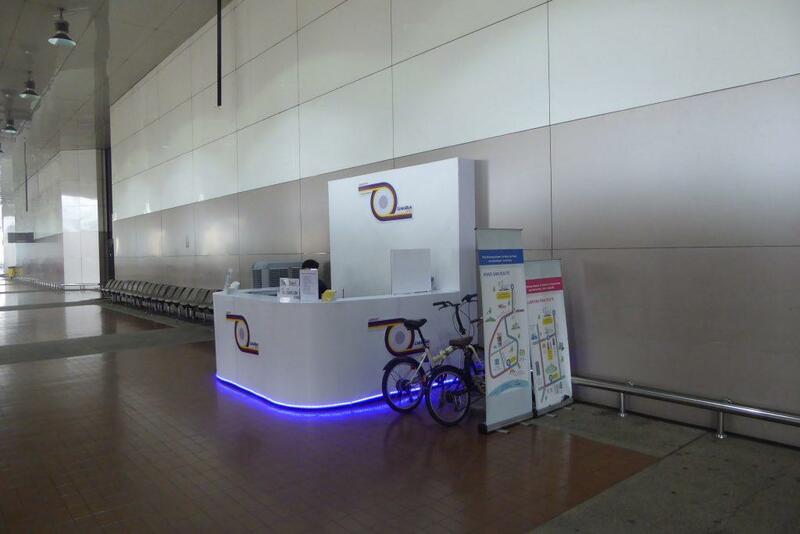 There are AOT Limousine service booths in the arrivals hall of both terminals. These are more expensive than a taxi. You can catch a train to Hualamphong Station from the Don Mueang station which is opposite the airport. It’s accessed via a bridge from floor 2 of Terminal 1. This is useful if you are staying in the Hualamphong or Chinatown districts. You can also catch direct trains to Chiang Mai and other destinations in North and North-Eastern Thailand. You can check timetables, fares and make online reservations here. There are no bus services from Don Mueang Airport. 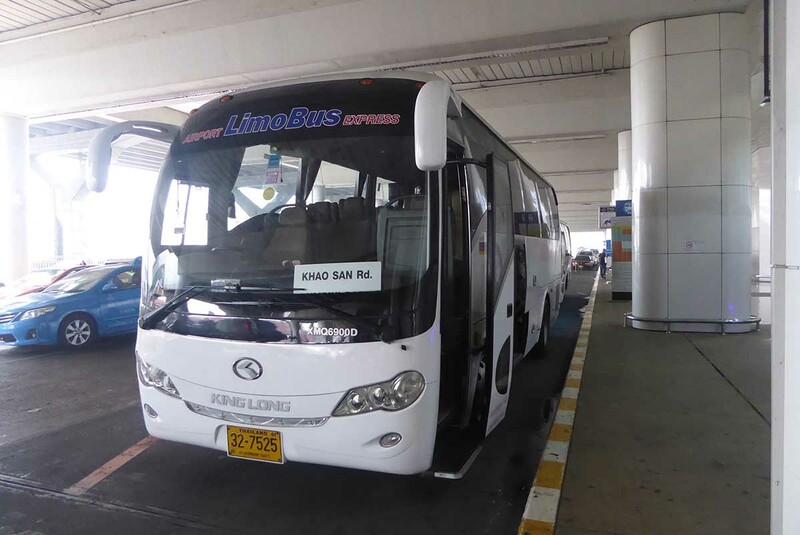 If you want to travel on by bus to destinations outside Bangkok including Chiang Mai, Phuket, and Hua Hin you can check schedules, fares and make online reservations here. All the car rental companies have booths in the arrivals hall of Terminal 1 and between gates 10 & 11 on the ground floor of Terminal 2. Thai’s drive on the left. You will need a valid International driving license. Check that you are fully insured for any vehicle that you hire. 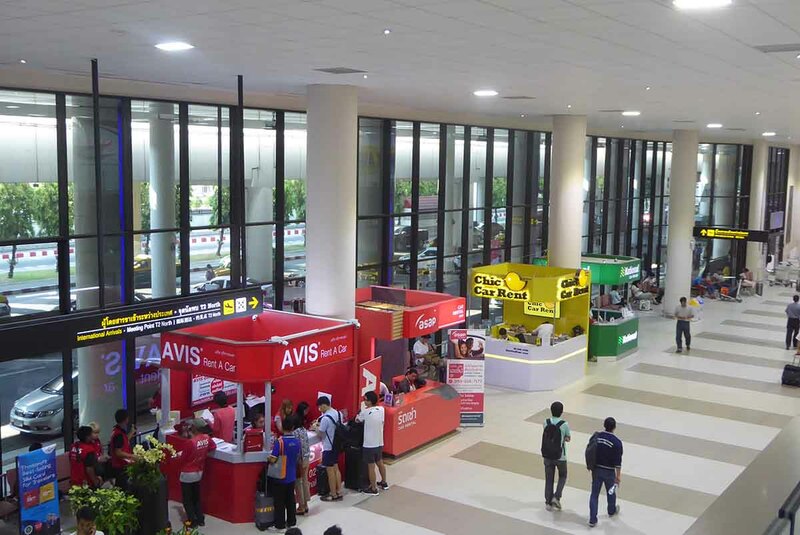 If you have a connecting flight departing from Suvarnabhumi Airport there is a free shuttle bus departing every 30 minutes from exit gate 5 on the ground floor of Terminal 1. You must show your flight ticket from Suvarnabhumi to use this service. Service hours are 05.00 to 24.00. Taxis from Don Mueang to Suvarnabhumi can be booked online here.